Lee Falk glamorized the humble dolphin in the incarnations of Solomon and Nefertiti — the two pets of the Phantom. For many like me, the utterance of the word dolphin would instantly take us down memory lane to the pages of The Illustrated Weekly of India or the Indrajal comics and Sy Barry’s bewitching art of the golden sand of Keela wee, the jade hut, the sojourn of the Phantom with Diana amidst the most endangered and threatened species of the planet. Those created a fantasy but ideal world that inspired a whole generation. Lee Falk’s depiction of those immortal creature characters infused a passion for conservation in millions of young minds at a time when most governments in the world are yet to come up with a conservation law! The Northeast is another ‘isle of Eden’ with many unique species and the Ganges River Dolphin (Platanista gangetica gangetica) is just one of them. One of the four obligate river dolphin species of the world, the Ganges River Dolphin (xihu in Assamese) is found in the Ganges-Brahmaputra-Meghna and Karnaphuli River systems of India, Nepal and Bangladesh. However, the abundance of the species has sharply declined over the years along with its range. The IUCN listed it as ‘endangered’ after the individual count estimated globally fall down to below 2000 in 1996. Because of its rapid decline the species came to be categorized as a Schedule-1 Species in India under the Wildlife Protection Act, 1972. It was a spectacular sight to see the greyish brown dolphin jumping in and out of water. They spend an average 107.3 seconds under water and 1.26 seconds above water. 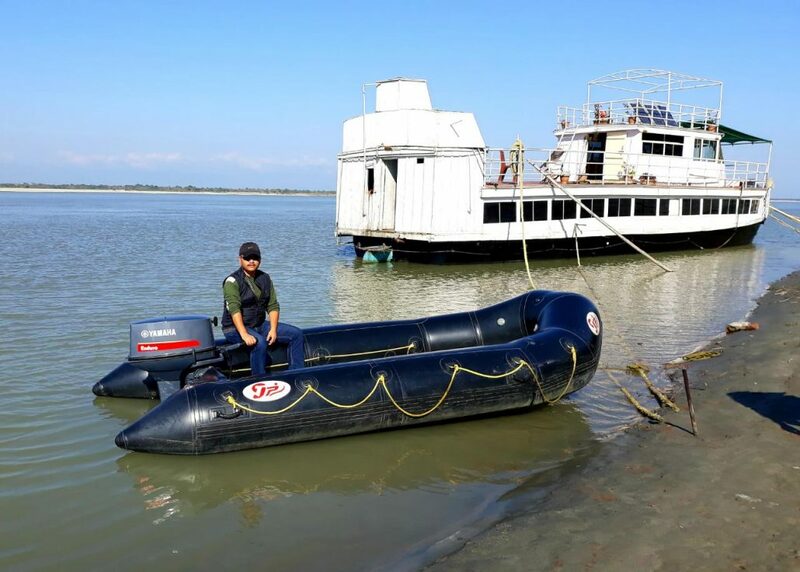 Once, the most commonly sighted aquatic mega-fauna in the Brahmaputra river system, it now faces extirpation from most of the major tributaries of the Brahmaputra and restricted to a few pockets in the mainstream. Unregulated rise in human activities is causing serious degradation in dolphin habitats in the Brahmaputra. Acoustic vision being the primary mode of perceiving the environment for these animals, increasing noise levels and industrial activities cause major disruption in their perception of biologically critical sounds. Scientists find conservation efforts of river dolphins in the Brahmaputra have largely ignored the aspect of Acoustic Habitat Degradation. Further, fishing continues to be one of the major threats to the Gangetic dolphin in the Brahmaputra. Accidental deaths of dolphins, through entanglement in fishing nets continue to concern conservationists. On the other hand, Subansiri dolphins face severe threats of extinction from the dams upstream. Sand mining and other development activities make Kulsi dolphins all the more vulnerable. Recently one of the channels of the Kulsi was blocked by the sand mining groups impeding the free movement of the endangered species. In 2012, there were 635 dolphins in the Brahmaputra system. 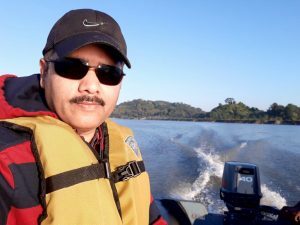 While there has been an increase in the Gangetic dolphin population in the Brahmaputra, the species has shown a decline in its tributaries, said Dr Abdul Wakid, Wildlife Institute of India project scientist. A comprehensive dolphin survey conducted by Dr Wakid last March confirmed the existence of more than 200 in the Brahmaputra mainstream and some 60 more in the two tributaries — the Subansiri and Kulsi. About 37 dolphins swim around at a 2.5 km stretch known as Domukha at the confluence of the Kulsi and the Batha rivers. The Kulsi is perhaps the only tributary to have hosted a healthy population of the species. 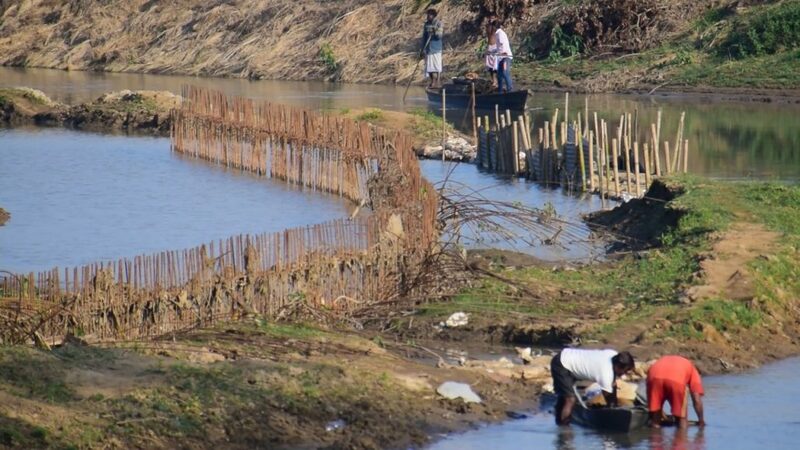 However, the Kulsi dolphins came under a severe threat as a multinational tobacco company located at Bortezpur in Kukurmara started erecting a 1.5 km wall right in the heart of that stretch of the river that host the dolphins. Locals allege that the company has encroached into 10 metres inside the river and also expressed their concern that this grave act would deeply impact their livelihood as most of the people in the area are dependent on the river for fishing and agriculture; but mostly they are worried for the survival of the river dolphins. “The wetlands in the area would supply abundance of fish into the Kulsi on which the dolphins survive, however, the transformation of agricultural lands and wetlands into industrial land banks has not only brought down agricultural production rapidly but have posed threat to the survival of the endangered species. Further waste disposal in the river by the industrial units and now the wall by Indian Tobacco Company in the Domukha have jeopardized the existence of the Kulsi dolphins,” said Bhagwan Das, a local youth. Kulsi, till the other day, was known as a safe haven for the river dolphins, thanks to the beliefs associated with these creatures. Villagers along the Kulsi consider killing of the blind aquatic creature as harbinger of bad luck. “It was in 1991, a local fisherman killed a dolphin in the Kulsi. On his return home, he found his son dead under mysterious circumstances. The news spread like wildfire and since then people grew a strong belief that one who kills a dolphin would ultimately lose a dear one. This belief had prevented locals from harming the creature and in a way helped in conservation of the species,” said a member of a local NGO. “The erecting of the wall in Domukha by the tobacco company will bring doom to the delicate creatures. The boatman here worries that his oars might accidently harm a dolphin. Such is the concern of the simple villagers. 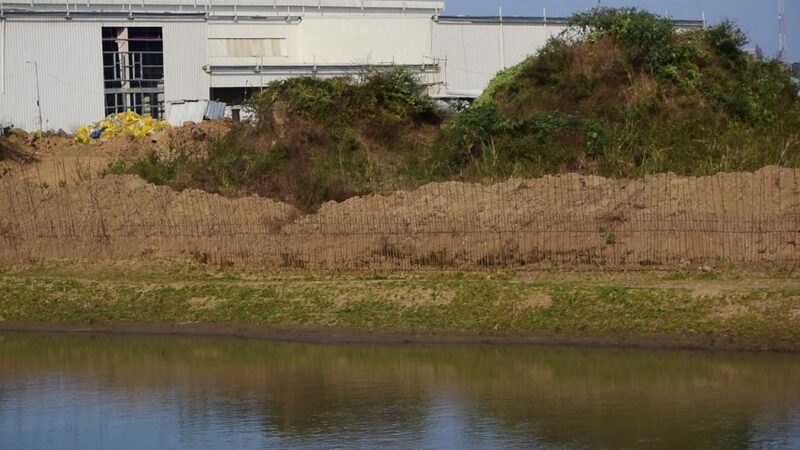 Contrary to these concerns, industrialists are now erecting a massive wall in the dolphin habitat itself. 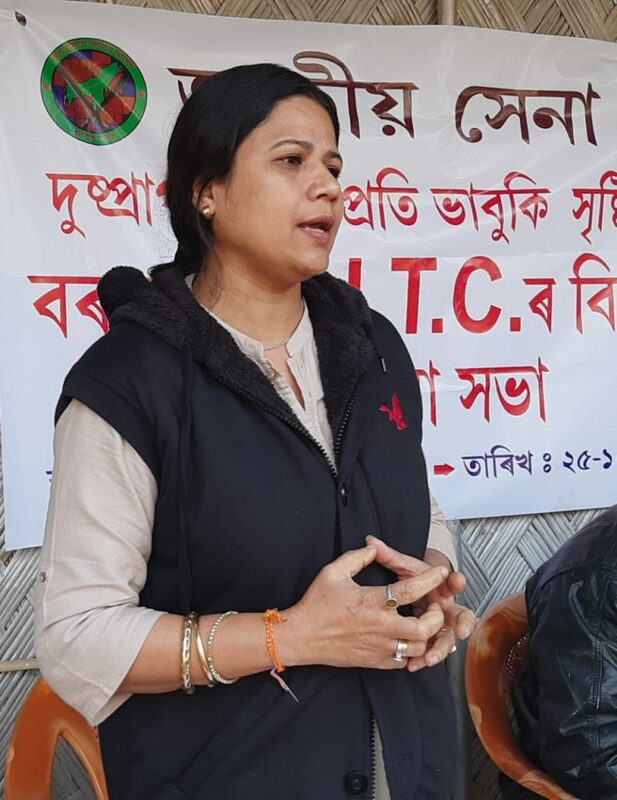 We wonder how the forest department and the district administration remain mute spectators to these illegal activities,’’ asks Khanin Kalita as he addressed a public meeting held on December 25 last year at Kukurmara. There were proposals to file a PIL against the violators in the meeting. A flagship species for the river ecosystem, its numbers indicate the health of the river. Often known as the Tiger of the Ganges, the dolphin’s position is same in the river ecosystem as a tiger in a forest. Declared Assam’s State Aquatic Animal in 2008, the Gangetic River Dolphin went on to become the National Aquatic Animal a year later. The Ministry of Environment, Forest and Climate Change (MoEFCC) in December 2016, announced a major programme to be undertaken for conservation of the Gangetic dolphin its ‘Species Recovery Programme’. The project aimed at developing a recovery plan for the Gangetic dolphin and their habitats across the country. The project to be implemented in Assam, West Bengal, Bihar, Uttar Pradesh, Uttarakhand and Madhya Pradesh for the initial period of five years (2016-21) envisages engagement of stakeholders in conservation of river ecosystems. Dr Wakid said that the conservation action plan focuses on regular population monitoring of the species in the Brahmaputra and Barak rivers and their tributaries and factors affecting the species and other aquatic animal habitats would be identified. However, questions are now being raised as to how the massive wall in the most unusual and critical patch of Domukha dolphin habitat had gone unnoticed even after constant monitoring of the species and its habitat. Kukurmara in south Kamrup, is located some 25 km from Guwahati and is an ideal destination for tourists coming to watch the river dolphins at Domukha. The Kamrup district administration recently voted the river dolphin as the City Animal of Guwahati. Unfortunately, the bid to glamorize the humble species is yet to show results in its conservation even in the Kamrup district. The erecting of the wall in Domukha has sent alarm bells ringing and conservationists feel that the Kamrup district administration should immediately come up with an economically viable eco-tourism project declaring Domukha a dolphin Sanctuary to secure its habitat freeing it from encroachment. The threat on their existence continues to loom large unless their habitats are secured.